This idea started as a sandwich and it ended as a sandwich. A very messy sandwich as you can see. A sandwich that I wouldn’t really recommend you make unless you own stock in a napkin company. 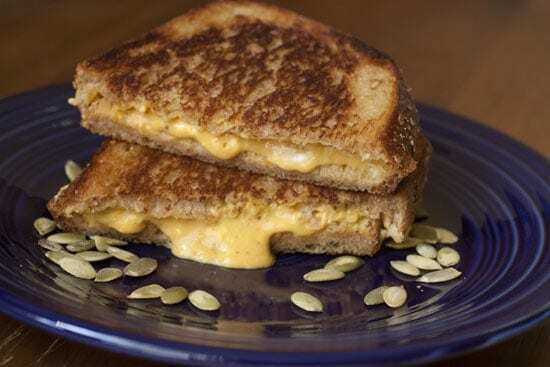 I had dreams of making a creamy pumpkin grilled cheese sandwich, but cream cheese doesn’t do a great job of holding together when it gets hot so the whole thing kind of just melted all over the place. Don’t get me wrong though… it was very tasty! I had no problem scarfing it all down, but it’s definitely easier to just use it as a spread. Pumpkin mixed with cream cheese and spices. Goes great on a ton of toasted items! 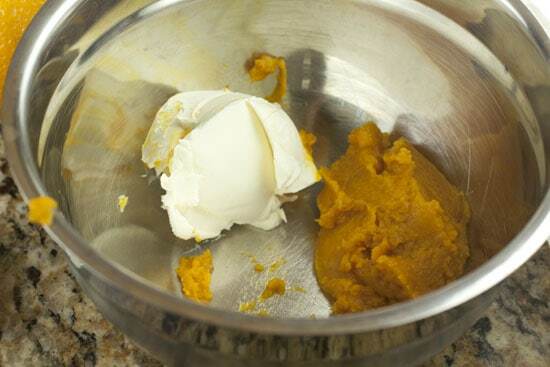 1) Mash pumpkin and cream cheese together in a small bowl. 2) Stir in honey, spices, and orange zest. 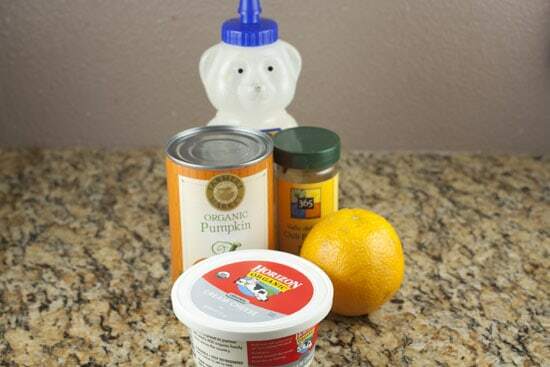 3) Use on toast, bagels, or almost any baked good. You could go the complete sweet route with this spread by mixing in standard pumpkin pie spices (cinnamon, nutmeg, allspice, etc. ), but I decided to give it a slightly different flavor with some chili powder and orange zest. It’s very important when making spreads like this to make sure you get just canned pumpkin. You don’t want the canned pumpkin pie filling with lots of crap in it. If you’re in doubt, take a look at the ingredients. They should only have pumpkin listed. Nothing else. Once you pop your can open just mix the cream cheese and pumpkin together really well. I just used a fork and kind of mashed it all together. These two things play nice together. It’s okay if there are some lumps. The only way to get rid of those would be to beat the mixture with a hand mixer or something and that’s more work than it’s worth in my opinion. Once your base mixture is mixed, you can add in your spices. The orange zest really makes the whole thing pop so try not to leave it out. Then just add a pinch of chili powder and salt to taste. The finished spread should be a lovely light orange color. Well that turned out bright! Honestly, I recommend stopping here. Use the spread like this for toast, bagels, or heck. Just eat it with a spoon if you want. It’s really delicious. But if you want to venture into the world of the messy, I have a sandwich for you! The key with this sandwich, if you are daring enough to try it out, is to do the exact opposite of what you would normally do with a grilled cheese. 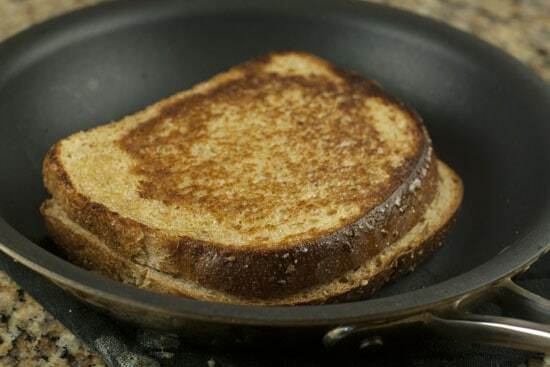 Normally, I recommend cooking grilled cheeses on medium-low heat which lets the bread toast slowly while the heat radiates into the cheese, melting it. If you do that with this sandwich, you’ll have a huge mess on your hands. Instead, you want to cook the sandwich on a high heat for about 45 seconds per side. That will toast the bread nicely, and just warm through the filling. 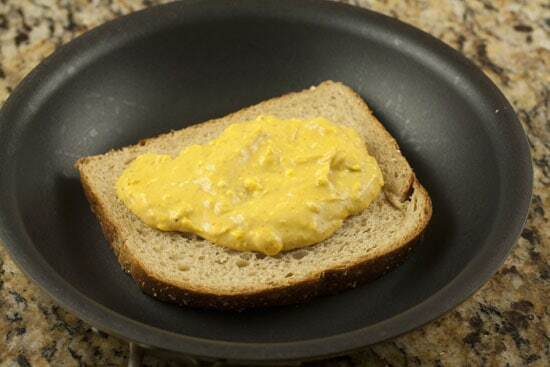 Butter a piece of bread and set it in a hot skillet. 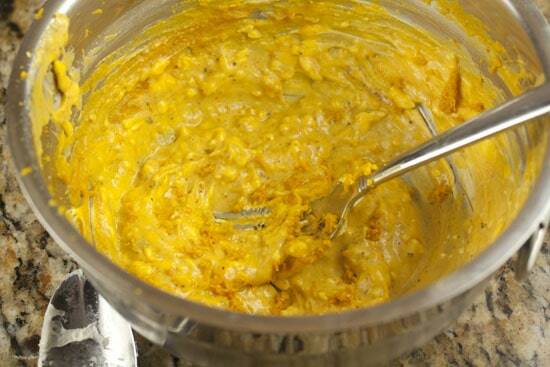 Add a few dollops of pumpkin spread to the bread. Top it with another piece of buttered bread (butter side up) and set it over medium-high heat. After about 45 seconds, carefully flip the sandwich and you should have a lovely browned toast. Cook it for another 45 seconds and your done. If you do it right, none of the pumpkin mixture will spill out. Let this cool for a minute before eating it. I cut mine in half just so you could see the runny (but delicious) mess that this sandwich is capable of. Just spread it on, people. By all means make the pumpkin spread in this post. It’s very Fall-ish. It would go great on a huge number of breakfast foods. Maybe don’t try to do what I did with the whole sandwich thing. If you wanted a sandwich you could always just toast two pieces of bread and stick them together with some spread in the middle! Don’t make something delicious harder than it needs to be. That spread looks great–my kids would love it spread on waffles! This could be an interesting way of using the pumpkin I got from my parents' garden! Yummy! Spreading some of that on top of your Flax Muffins sounds really tasty! I tried this dip today with some Delicata I took from the garden and roasted. It was vurrah extremely tasty-like! Every year around Thanksgiving my wife buys more pumpkin than neccesary, and I never know what to do with the extra. I think now I'll be making this and putting it on bagels. Mmmmmm. Yep, I think I just made a Homer Simpson face. 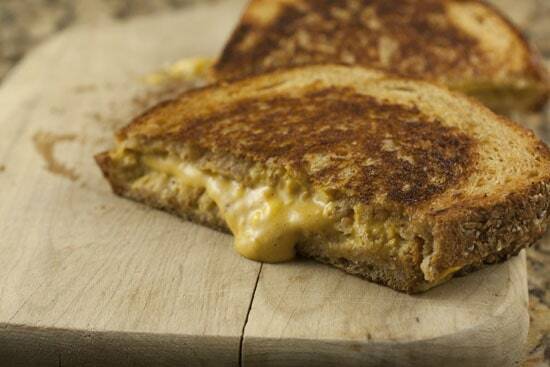 I wonder if it would work with another kind of cheese… That looks so good I'd be all over it. Thank you for the ample warnings about the mess. It is appreciated. Maybe if you rolled it like a burrito with the ends tucked in and then pressed it? That way it would stay inside without leaking? Either way, love the idea! This looks like it would be good as a spread on French Toast.